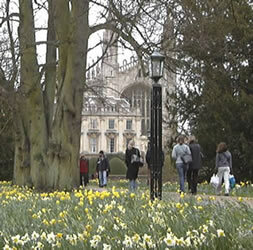 Visit city of Cambridge : tourist guide, photos and sightseeing tours. 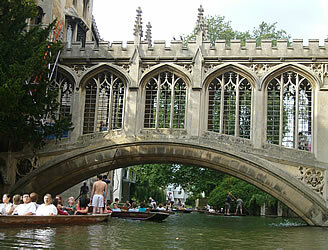 This page provides an introduction for visitors to Cambridge. 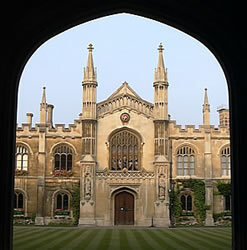 Students first came to Cambridge in 1209, and the first college (Peterhouse) was established in 1284. 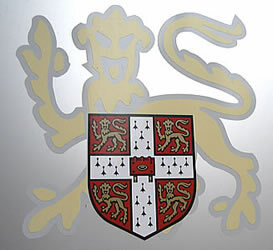 There are now 31 different colleges connected to the University of Cambridge. There are also several scientific museums (many great scientific discoveries were made at Cambridge). 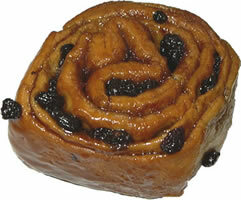 Tutorials are normally given by a member of staff (or a postgraduate student) from the same college. Students usually live in a room inside their college, or in a hall of residence in another part of Cambridge. 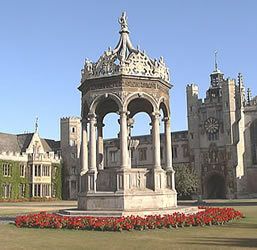 Most of the land and property in the centre of Cambridge is owned by the colleges. 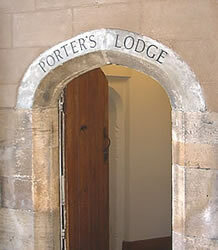 Much of the daily life of the college (for example: security, post/deliveries, room/meal bookings) is dealt with by the porters, who are based in the building at the entrance known as the porter's lodge. 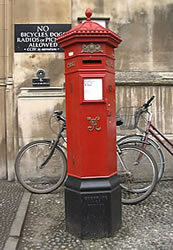 Students pass through here to check their mail before cycling to their lectures (these are organised by the university and are attended by people from any college). Colleges may only be open to the public at certain times of the day (the most popular ones charge an entrance fee), and are usually closed to visitors during the exam period between mid-April and mid-June. 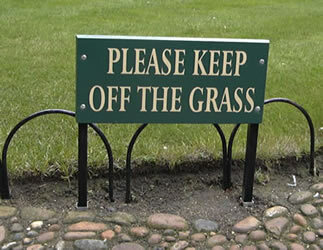 Students and visitors are not allowed to walk on the grass inside the colleges. Colleges each have their own chapels. 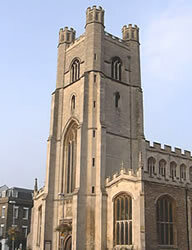 The most famous is King's College Chapel, which has one of the top choirs in the country (the carol service from here is broadcast on radio and television before Christmas each year); members of the public are welcome to join services of worship in the chapel, but must pay to visit it at other times. Don't walk on the grass in the colleges! The coach drop-off point in Cambridge is in Queen Street. From here you have a view of the area of Cambridge known as "The Backs", which is particularly attractive in the springtime. There is a good view of King's College Chapel. Walk down Silver Street towards the town centre. On the left-hand side of the road you can see the Mathematical Bridge. Punts are available for hire from the boatyards at the end of Mill Lane. At the end of Silver Street, turn right into Trumpington Street. Walk to the end of the road on one side, and then walk back to Silver Street along the other side of the road. 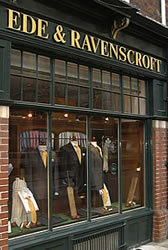 Ede & Ravenscroft started to make academic robes in 1689, and produces the robes used by British kings and queens at their coronation ceremonies. 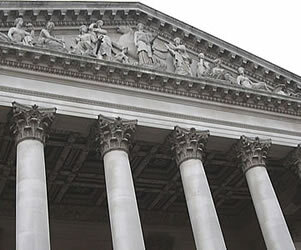 The Fitzwilliam Museum is the biggest and best-known museum in Cambridge. The large neo-classical building contains many interesting works of art from around the world. 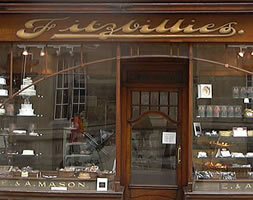 Since 1922 local people and students enjoyed cakes and pastries from Fitzbillies (the shop closed in February 2011 but reopened in August 2011 under new management - see: http://www.fitzbillies.com). Walk along the pedestrian area known as King's Parade. 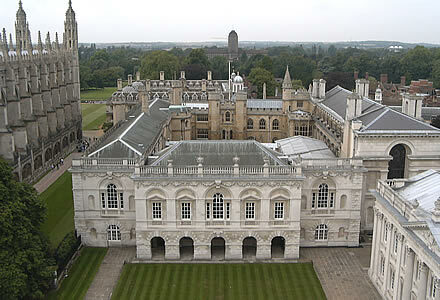 This area includes the entrance to King's College. Inside is the famous King's College Chapel, which has one of the top choirs in the country (the carol service from here is broadcast on radio and television before Christmas each year). You can join services of worship in the chapel for free, but must pay to visit it at other times. 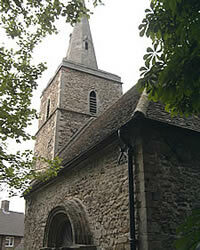 At the end of King's Parade is a church called Great St Mary's. For a small charge you can climb to the top and enjoy excellent views of King's College Chapel, the Senate House (where degree ceremonies take place at the end of June) and the market square. Follow the road called Trinity Street (which becomes St John's Street and then Bridge Street). 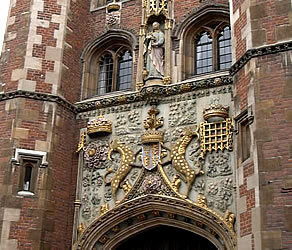 You will pass the entrance gates of two of the most famous colleges: Trinity and St John's. One of the shops on the right-hand side is Heffers: a large bookshop which is popular with students. 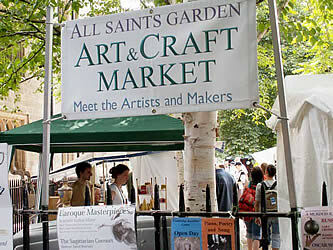 On Saturdays (and on some other days) you can enjoy visiting the All Saints Garden Art & Craft Market. Here you can buy products directly from local artists and craftspeople who made them: among the stalls are ones which specialise in fused and stained glass, jewellery, painting, pottery, wood-turning and photography. At the end of the road is the Round Church (formally known as the Church of the Holy Sepulchre). 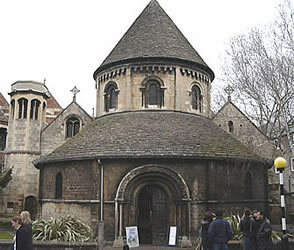 This was built in the 12th century and includes a brass rubbing centre. There is a small entrance charge. On Magdalene Street there is another boatyard from which you can go punting. A punt is a flat wooden boat, which is steered using a long wooden pole. During the summer (from April until September), visitors can hire their own punts (as well as the hire fee, a deposit must be paid which is given back to you when you return the punt). Alternatively, you can sit back and relax in a punt with an experienced chauffeur, who can also provide information about the places which you are passing. 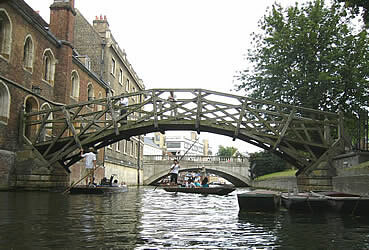 Punting is a popular activity both at Oxford and at Cambridge. 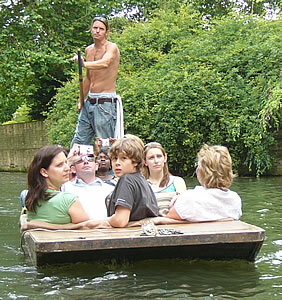 Normal punts can take up to 6 adults. Chauffeur punts can carry up to 12 passengers. From Magdalene Street you can walk up the hill to Castle Street. 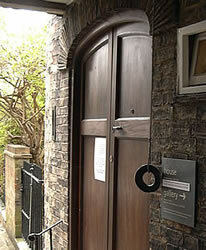 On the left is an attractive small church called St Peter's, near which is the entrance to a gallery and house called Kettle's Yard (check opening times before visiting). To enter the house you need to pull a bell rope in front of the door: someone will then come and let you in. 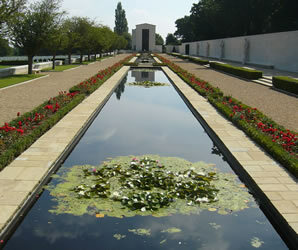 A short drive from Cambridge is the American Cemetary (the easiest way to visit this is to take the City Sightseeing bus). 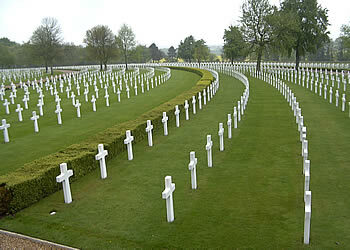 This cemetary is a memorial to US soldiers and airmen who died in the Second World War. Thousands of headstones represent those who died. 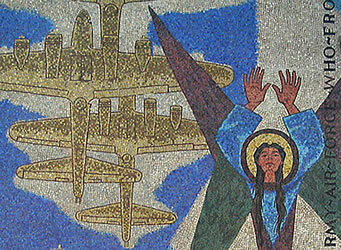 On the roof of the chapel is a mosaic showing aircraft making their last flights which are being accompanied by angels. 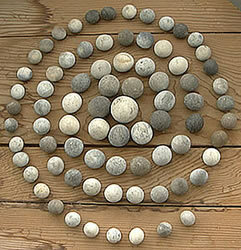 Looking for some ideas for souvenirs? 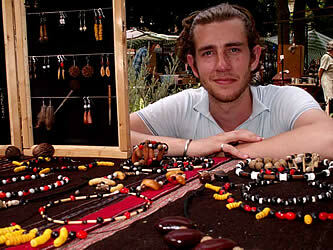 One idea is to look for something in the Art & Craft Market. 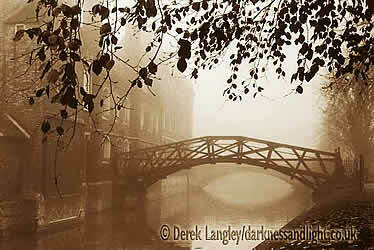 One of the people you may find there is the art photographer Derek Langley: two examples of his work are shown below. 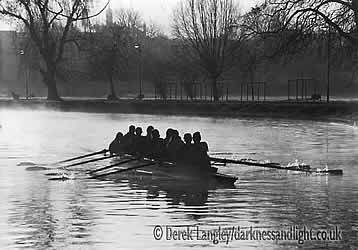 His sepia and black & white photographs, calendars and posters of Cambridge can be ordered online from: http://www.darknessandlight.co.uk. 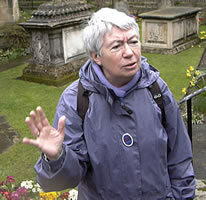 - Walking tours organised by Cambridge City Council: http://www.visitcambridge.org/TicketServer/GuidedTours.aspx. 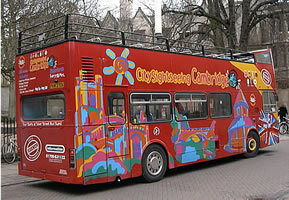 - City Sightseeing buses provide commentaries in several languages and you can get on and off the buses at any point. The starting point for these buses is the train station. 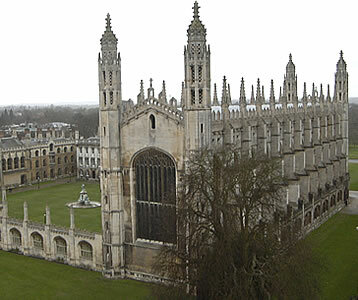 - To travel to Cambridge independently from London, the most convenient way is to take a train from King's Cross station (non-stop services take about 45 minutes). 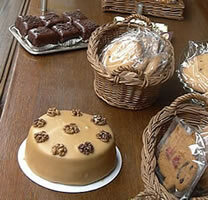 For timetables and to book a ticket, see: Shop/Company/TheTrainline.